Maggie McKenzie battles overwhelming rejection, raccoon attacks and personal space invading coworkers with only random facts and a growing sense of adventure. With such a short summary, I wasn't really sure what to expect from Rejection. I read it on the heels of The Enchanted Truth by Kym Petrie, which was a neat happenstance. The two books felt related to me: The Enchanted Truth's message was sort of the moral of Rejection. And reading Rejection was like seeing The Enchanted Truth played out in modern adult life. I really felt for Maggie. So many bad things come her way, and she does have some woe-is-me moments, but for the most part she was great at not feeling sorry for herself. I loved reading about her attempts to 'find herself,' and how she eventually comes to the realization that she is enough, just as she is and she deserves more than what the man in her life can offer her. The minor characters, mainly in Maggie's office setting, are what really made this book for me. They were hilarious and very well-developed! Maggie's job, as well, was interesting and I liked seeing her shine at work when she wasn't necessarily shining in her personal life. I did like Maggie's best friend Abby as well. (But why did Maggie sometimes call her Abby and then other times call her Abigail?) Abby added a lot to the story and seeing she and Maggie's interactions provided insight to Maggie's character. 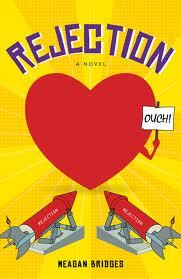 Overall, I really enjoyed Rejection. It is a good example of what I like best about women's fiction: a strong heroine, great emotional writing and a good, realistic ending. I would recommend Rejection to fans of contemporary fiction and fans of women's fiction.